Most science fiction fans are happy to shrug off technical inaccuracies while enjoying a movie. But not if you're the director of the Hayden Planetarium and a world-renowned astrophysicist. Which is why Neil DeGrasse Tyson couldn't help but question one of Prometheus' technical gaffes. In the film they travel 35 light years into space, which Charlize Theron's character comments as being about half a billion miles from Earth. But that estimate's a little off. Like, way off. 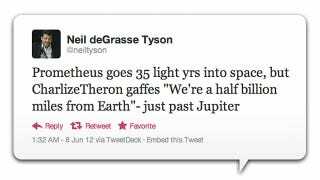 As Tyson points out, half a billion miles from Earth would only put you just past Jupiter. In reality, a single light year equates to 5.88 trillion miles, not billion. So 35 light years would have put the crew some 205.8 trillion miles away from the Earth. Well past Jupiter, and well outside of our solar system.